The sisterhood: Nervous about safety? Forche is the answer for women. What’s so comforting and gratifying about being driven around by a woman cabbie? 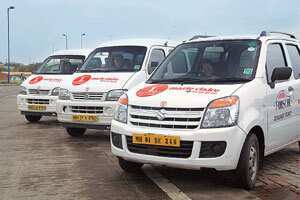 The question failed to enthuse a dozen inebriated revellers at a hen party a few days before I called Mumbai’s (India’s) first all-women dial-a-cab service. “I would take it just to support the women who are running it," said one. More lukewarm responses—“Security, maybe? "; “It won’t make a difference, I haven’t had any bad experience with male cabbies in Mumbai"—and we moved on to far more risque topics. After the 40-minute ride a week later, I was enthused enough to recommend the service. On the appointed day, Revathy Roy, the lady who was driving me to the Gateway of India from Bandra at 6.45am, rang my doorbell a good five minutes before time. The Forsche cab (“for she", intended, of course, to rhyme with Porsche) was a white Indica with prominently designed advertisements for Marie Claire on its front and back. The moment I stepped in, Roy, who is also the owner of the company, asked how I came to know about Forsche, and why I called for it for a drive in the morning. “Normally, ladies call us at night—to go to the airport or to parties or when they get late at work," she said. Obviously, Forsche does appeal to women who worry about safety. Forsche, introduced on Mumbai roads on Women’s Day (8 March), didn’t take off well. They still largely depend on word of mouth, but in the last two months, they’ve acquired 28 cars—including WagonRs, Indicas and, the latest addition, Scorpios. The company employs 48 drivers. Roy has started another service for families, called Priyadarshini, because some women cribbed about the women-only rule. Husbands and sons are allowed in Priyadarshini, a 24-hour service run by three shifts of drivers. Forsche cabs have also recently opened a counter at Mumbai’s domestic airport. On 14 January, Forsche opens in New Delhi. Starting in south Delhi with about 20 cars and 30 drivers operating till late evening, Forsche will branch out to the airport and other parts of New Delhi. “That’ll be a real test. Passengers who come from Delhi have told me it would work better there than in Mumbai," said Roy. For the easy commuter—used to torn seats, swarming mosquitoes and stale odours inside the yellow-and-black Fiat that’s Mumbai’s staple—this ride is nothing short of a luxury. The seats were covered in clean, ironed cotton upholstery. The AC could be regulated. The flooring was clean plastic mats, and the vehicle smelt fresh. Says something about the Indian man’s failed relationship with hygiene, eh? Since it is a women’s-only (sons, grandsons, brothers and nephews below the age of 12 can tag along) service, there are two foldable mirrors at the back, a foldable tabletop where you can place the magazines stocked inside to read (I didn’t spot a Marie Claire) or to place your hands for a quick manicure (a dinky manicure set and nail paint is part of the package). They’re not disposable sets, so I refrained, although the filer begged to be picked up. The usual glitches of a start-up continue. You need to call at least a day in advance so, for now, Forsche isn’t equipped enough to meet your emergency needs. Big cars have just come in, so you need to call a couple of days in advance for big groups. Forsche doesn’t yet drive to hilly or beach getaways from Mumbai, although it has started plying to Pune and has a centre in Thane. The fares are steep by any standard. The bill Roy wrote out after she pulled over at the parking area outside the Gateway far exceeded my expectations: Rs285, charged by the kilometre, which is almost double the fare you would pay in a regular taxi and more than that of a radio taxi. Prithvi theatre may be the haunt of theatre lovers in Mumbai, but its charming café, shaded by trees and lit by papier mâché lamps, is as much a coveted space. The Prithvi Café’s Irish coffee is spoken of in the same way as Sanjna Kapoor’s efforts to nurture theatre. Until now, most people flocked here for its ambience and coffee; the good food being an aside. But Kunal Kapoor, Sanjna’s brother, has now decided to make food the priority, and the responsibility of managing the café has gone to Riyaaz Amlani of the Mocha chain. They are paying tribute to the dabbawalla concept by offering a menu that has the best and most popular food that the city has to offer. Like the dabbawallas, the staff will gather food from their original outlets in the morning to serve here through the day—be it the kebabs of Noor Mohammedi, samosas from Gurukripa, falooda and fresh fruit ice cream from the Taj of Bohri Mohalla or snacks from American Express Bakery. The best picks: the Taj’s hand-churned sitaphal ice cream and Noor Mohammedi’s chicken tikka roll and shami kebab. Make sure to end the meal with the delicious phirnee from Suleman’s at Mohammad Ali Road. For the samosa and vada pav lover who likes to bite into his fried snack fresh off the fire, the morning’s fare definitely won’t cut it. Thankfully, the kebabs will be brought marinated and cooked in the café tandoor. While the shami kebab melts in the mouth, the sheekh kebab unfortunately wins the battle with the fork. A large part of the menu is coffees and desserts from Mocha. Just like the best of Brownie Point and Pot Pourri in Bandra, I wish they had just stuck to a few best from the Mocha menu, too. Many of Mumbai’s landmark favourites are conspicuously missing from the menu—Amlani did try, but wasn’t able to convince Britannia, Kayani, Sardar Pav Bhaji or Delhi Darbar to participate. The management has retained the original prices of the items on the menu. The teas start at Rs8 and the coffees go up to Rs50. The sandwiches and eggs are priced around Rs50, the chaats around Rs30, desserts start at Rs25 for brownies and go up to Rs70 for the Mocha and Pot Pourri confections. The kebabs, at Rs150, are the most expensive items on the menu.